Apple may claim that the safety features of devices with FAceID are safer than fingerprint scanners. This is because FaceID cannot be fooled by photos, and unlike fingerprints that are easily replicated. FAceID has also been tested with 3D masks made similar though. Well, unfortunately, FaceID still has weaknesses, although this is very difficult for others to imitate. According to this uploaded video on Youtube (please see below), faceID can be fooled by the identic twins of the user. This is done using the latest iPhone, the Iphone XS MAX. But actually Apple has realized this by making a little disclaimer about FaceID protection for family members, especially for identical twins, so that is something that is understandable. But maybe you still hope that Apple can make it better to overcome this. It is possible that this improvement will occur in the upcoming FaceID technology, but for now there doesn't seem to be much change, at least for the identical twins. 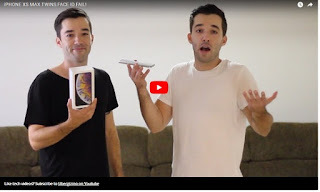 0 Response to "These Identical Twins Successfully Deceive FaceID On iPhone Xs Max"